Hello after far tooooo long, I haven’t forgotten you…..
After a hiatus of months I haven’t forgotten you all! It’s been such a busy and exciting year: an adventure in Europe, a house renovation – still in progress and really an overall life reno! 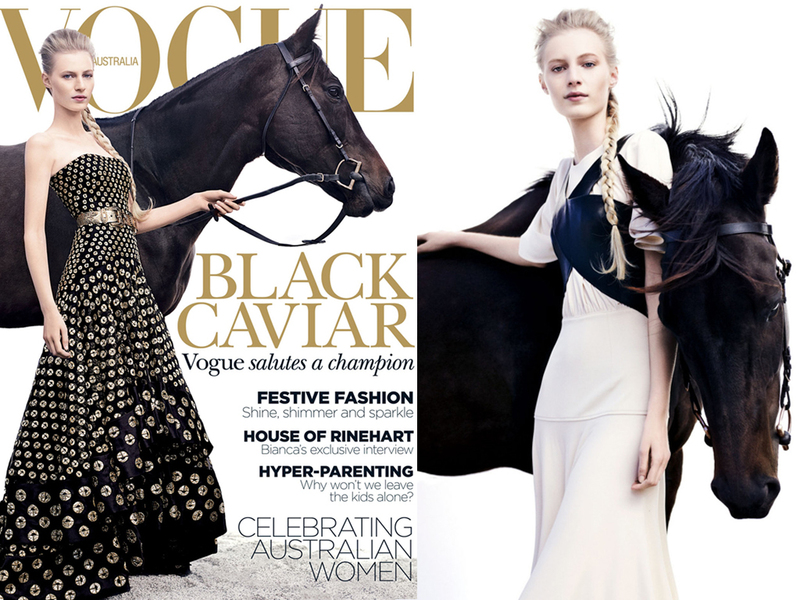 Dazzling beauty and horse racing sensation Black Caviar graces the cover of Vogue Australia, making cover girl history! She’s the fastest racehorse in the world, and Australia’s most beloved sports star, and it’s the first time in the magazine’s 53-year history that a horse will appear on the cover. Black Caviar (known at home as “Nelly”) was photographed by young Australian photographer Benny Horne in the foothills of the Dandenongs in a purpose-built outdoor studio alongside the thoroughbred of Australian modelling, Julia Nobis. Weighing 570 kilograms and standing 16.2 hands, the statuesque bay mare is not our every-day cover girl, yet she is undeniably beautiful. No doubt she’d rather have been galloping down the straight at Flemington or Randwick than standing in a paddock, but she was on her best behaviour while posing with internationally renowned model Julia Nobis for photographer Benny Horne. The history-making mare is undefeated in 22 races. 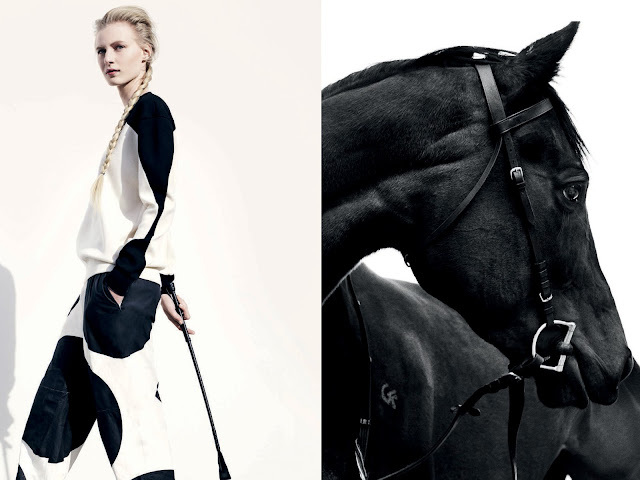 Captivating equestrian images by Dutch photographer Ditte Isager for the Horse Riders Journal, Spring 2012. 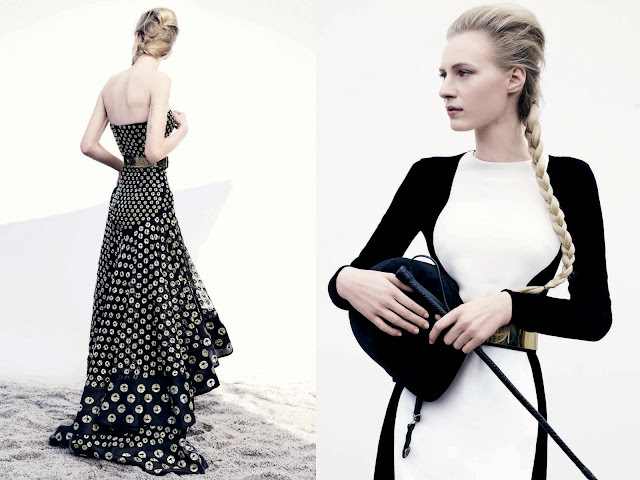 Some lovely winter white horses from Vogue China, 2005.
for these stunning shots promoting the Melbourne Cup. beside Rachael as she holds the rein. Images: Rachael Finch with fully trained show horse called Ammo. the pin-up girl of world racing who puts on breathtaking displays of speed. She is an iconic Carousel Girl. The Black Caviar story began on a houseboat in Echuca. Each February, for as long as any of them can remember, long-time friends Colin and Jannene Madden, Gary and Kerryn Wilkie and Neil Werrett have hired a houseboat at Echuca. The five families, who go back as far as kindergarten, have gathered for an annual water-skiing trip. The tradition of enjoying summer at the popular town on the Murray River gained momentum each year as the families expanded. The 2007 trip by the group, , was no different to any other, besides Sydney-based businessman Werrett’s insistence that the group “get organised” to get a new a car. And as a first time car buyer” Neil was excited. He thought it would be great if we all raced one together — as much as an excuse to have lunch, I believe getting a horse and race it will be so much better ” Gary Wilkie said. On the same annual houseboat holiday the following February, Werrett’s original idea had become a firm commitment. So they put Caulfield trainer Peter Moody on the case and after a time, Moody discovered the horse. And within weeks, the commitment had a price tag and a pedigree, but not a name. Part-owners David and Jill Taylor (both far left), Gary (with trophy) and Kerry Wilkie (far right), with trainer Peter Moody (centre) and jockey Luke Nolen after Black Caviar’s. Peter Moody had just spent $210,000 on a big lump of a filly by Bel Esprit at the Melbourne Premier yearling sales. Pam Hawkes, a Mornington Peninsula spud farmer (and Jannene Madden’s sister) came on board and named the filly. Hawkes had a penchant for black caviar and other seafood. The Bel Esprit filly’s grandmother was Scandinavia. Wilkie’s daughter came up with the colours — salmon with black spots (caviar). Taylor’s wife’s horse is now Australia’s horse. Soon, the world may lay claim to Black Caviar. Black Caviar, with those flag-fluttering fans, who form queues to have cards signed by her trainer, is the Sunline and Makybe Diva of her time. Her owners and their friends and family have become a logistics-challenging, race-day army of about 60. Each owner uses the same sentiment to describe the journey. Colin Madden, a lawyer, said Black Caviar initially appealed to him not because of who she was but because of the AFL team she was linked to. Madden is a Bombers fan. Black Caviar’s sire is part-owned by Kevin Sheedy. ”I know bugger all about horses, but I’ll hop into anything involved with Essendon,” he said. The patriarch of Australia’s greatest equestrian dynasty, five-times Olympian Bill Roycroft, passed away yesterday at the age of 96. Roycroft, who was Australia’s oldest surviving Olympian, heroically won Australia’s first Olympic gold medal in the three-day event at the 1960 Rome Olympics at the age of 45.
in the three-day team event despite riding with a broken shoulder. while heavily sedated, having effectively broken out of hospital. Individual and Team Gold, Rome 1960: Australian equestrian team members (from left) Laurie Morgan, John Kelly, Neale Lavis, Bill Roycroft and Brian Crago. Morgan won the individual three-day gold medal, and he, Lavis and Roycroft won the team event. Bill made the 1960’s Rome Olympics an unforgettable event. His unimpeachable performance brought the Australia on the path of victory. It was a remarkable feat after he was initially considered unable to compete in the final round after breaking his collarbone in a fall in the steeplechase. He had flown by helicopter to hospital outside Rome. When other team members were unable to compete, Roycroft famously signed himself out of hospital against doctors’ orders. On the field, his comrades had to dress him for the last ride by the dint of injuries. He was unable to bend himself but with all his profound strength he holistically completed the round of 12 jumps and clinched the gold for the team. But when other team members were unable to compete, Roycroft famously signed himself out of hospital against doctors’ orders and completed the final showjumping round flawlessly. Here he was catapulted to international stardom and won a gold medal for Australia. That was the most prestigious moment! Bill Roycroft is one of Australia’s greatest Olympians. He was born on a dairy farm in central Victoria in 1915 and grew up during the Depression. Bill rode in his first Olympics at the age of 45, in Rome, 1960. Bill went on to compete in four more Olympics. He established a dynasty with his three sons Barry, Wayne and Clarke, who all went on to compete in Olympic eventing, as did Wayne’s former wife Vicki. As head coach, Wayne Roycroft also led the Australian team to three consecutive Olympic eventing gold medals from 1992 to 2000.